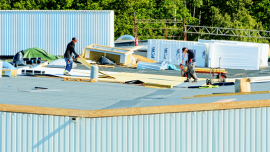 The average commercial roof—which is around 10,000 square feet in size—can cost around $42,500. If you do not maintain your roof, you might be shelling out for a new one every year. The roof is one of the most important parts of any commercial structure, and it should be able to withstand the heat and the cold. 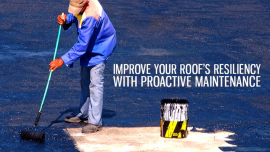 Regular maintenance is essential to keep your roof in tip-top shape. Downspouts and drains – There should be no clogs. Clogging can lead to leaking or burst pipes. Flashings and penetrations – If these have tears or gaps, it can cause your electric bill for cooling and heating to spike up. Vents – Some roofing contractors only check your outer roof. A real professional will also check the ceiling and vents to see if they are sealed up. 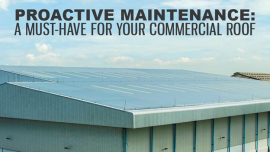 When you request a checkup from a reliable commercial roof maintenance company, you can expect a complete report. Should they find any problems with your roofing system, the contractor will offer replacement or repair solutions. The best contractors can give you options so you can make an informed decision. They don’t simply tell you what they will do to your roof and force you to pay up. Make sure the contractor you choose is qualified and has experience in commercial roof maintenance as well as repairs and installation.